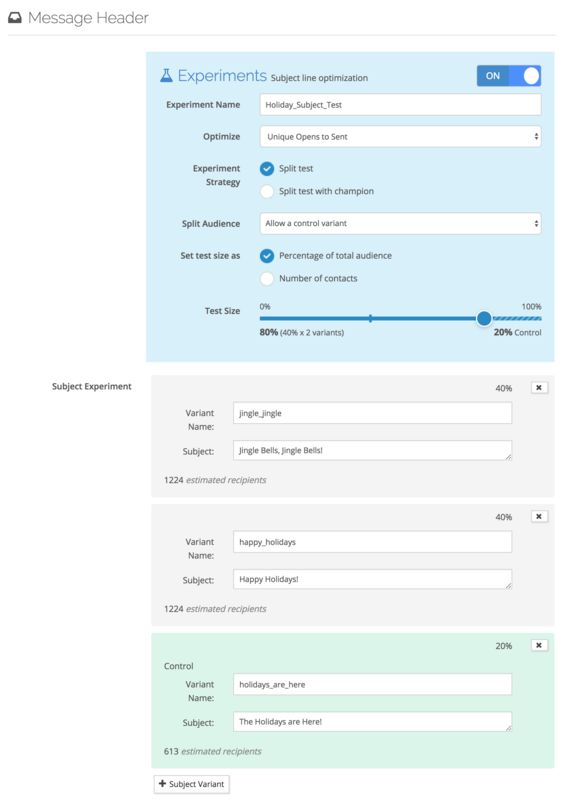 Note: Future enhancements will include other KPIs such as custom conversion events. 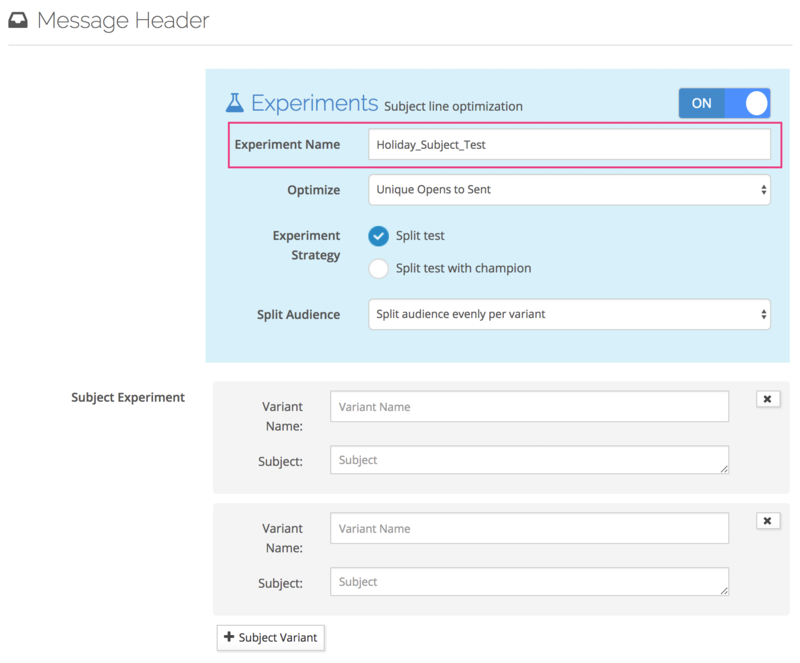 Split your audience evenly per variant. Set the variant sample size (in percentage or number) and allow for a control variant. 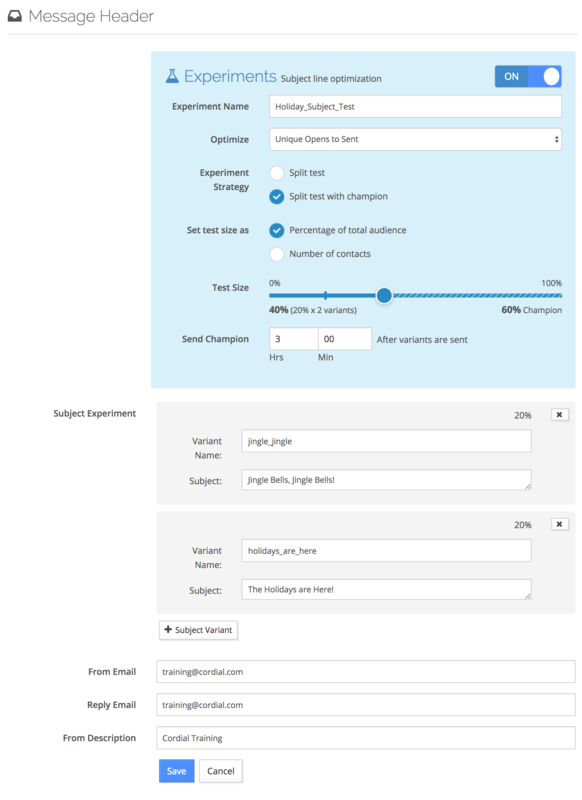 Split test with champion - Set sample size per variant (in percentage or number) and automatically send a champion. 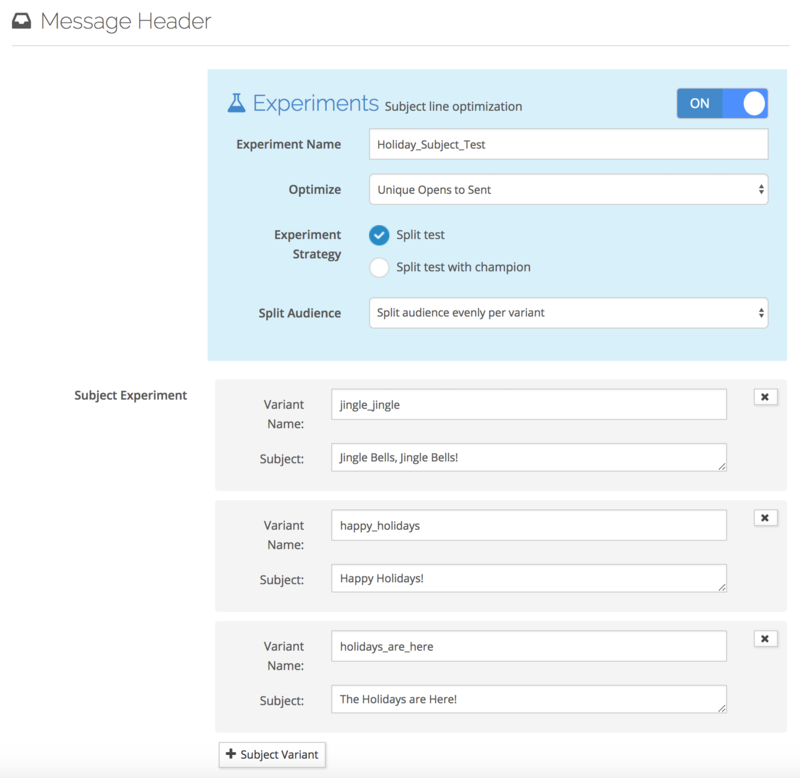 Create a new message or open a draft and edit the message header. 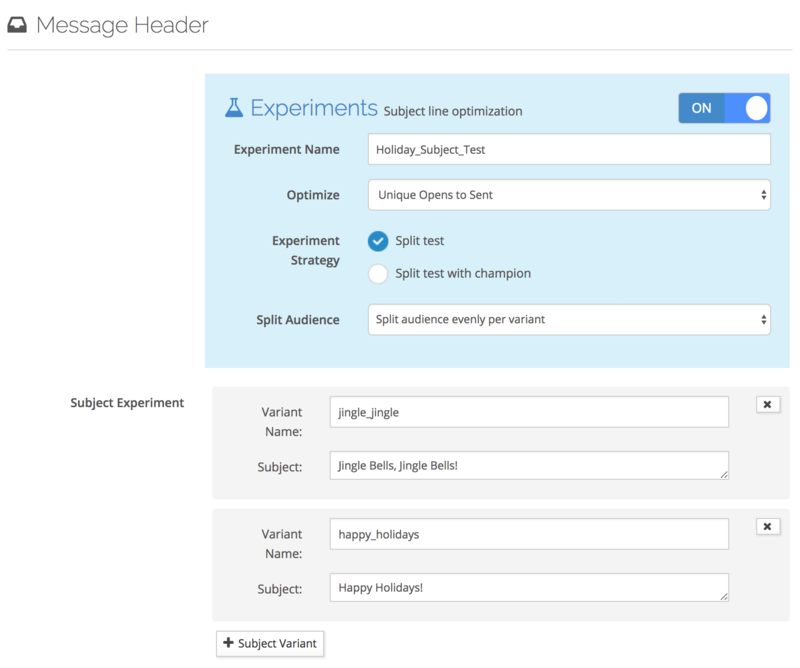 Enable the subject line experiment with the toggle switch. This is the overall name of your experiment. Names can only contain alphanumeric characters, dashes, underscores and no more than 30 characters (i.e. Holiday_Subject_Test). Choose what you’d like to optimize for. This is the metric that will be used to determine which variant performs better. 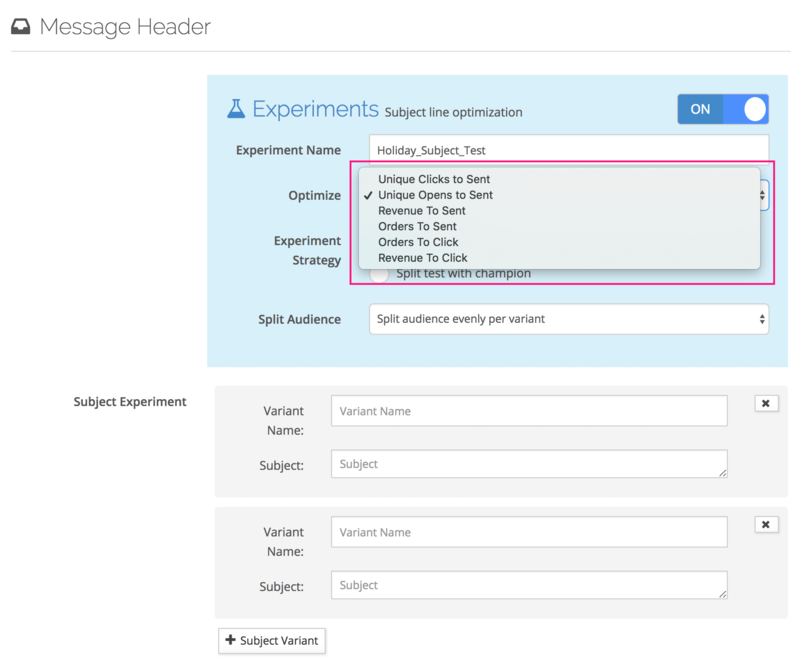 You're able to optimize based on a contact's message engagement (unique opens and unique clicks), orders (orders to open and orders to click), or revenue (revenue to open and revenue to click). Choose either a Spilt Test or a Split Test with Champion. 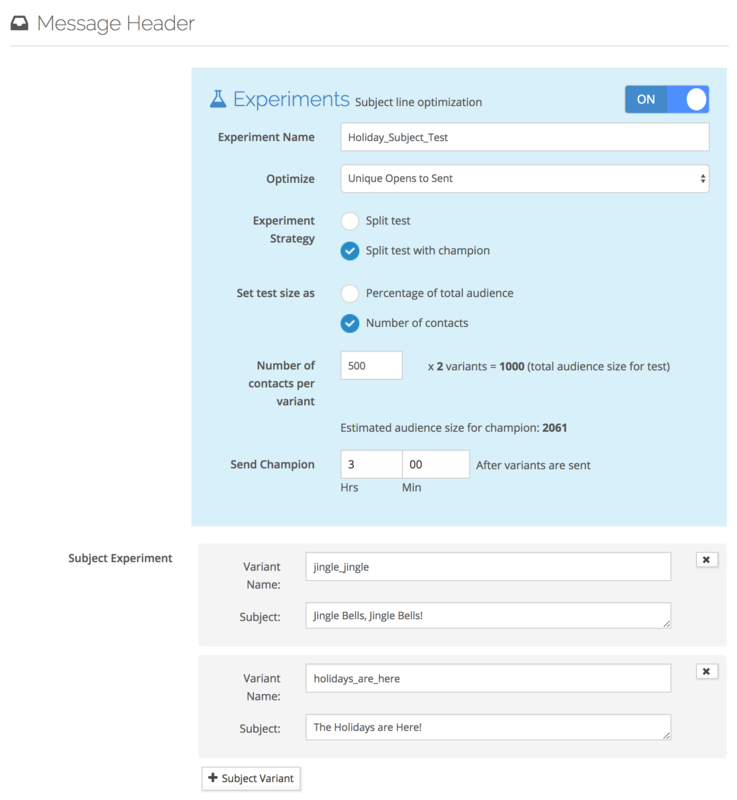 A split test will determine how the audience is split for the experiment. 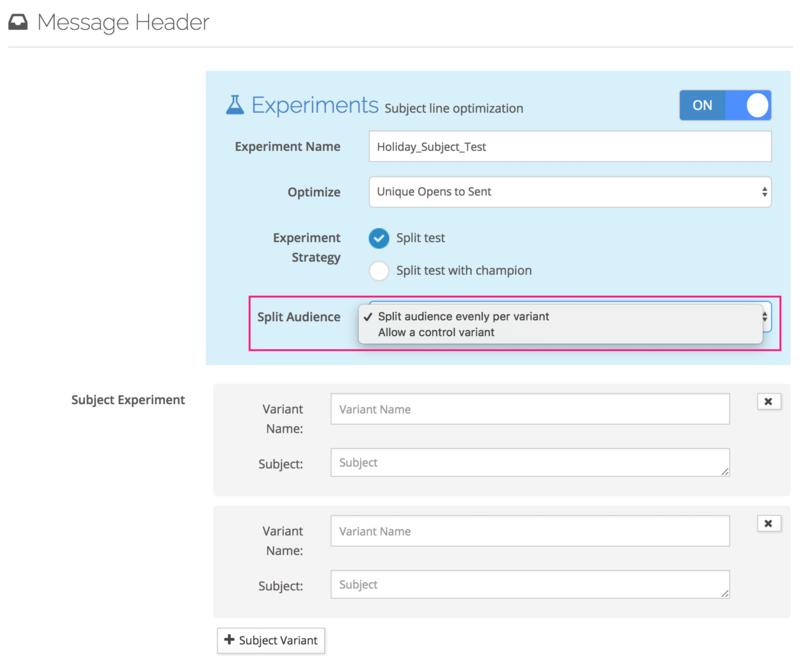 Split audience evenly per variant - splits the audience evenly between the variants. 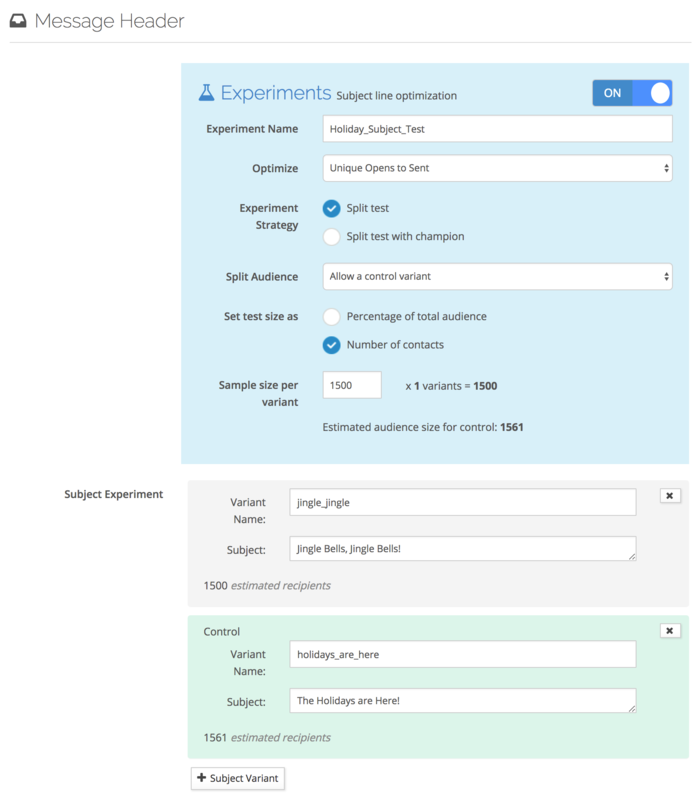 Allow a control variant - allows you to add a control variant in addition to the experiment variant(s). You can choose the split based on a percentage or a number. Allowing for a control variant lets you set aside a group of people (control) to test your variant against. You will see the control variant input (light green box) show up below the variants. 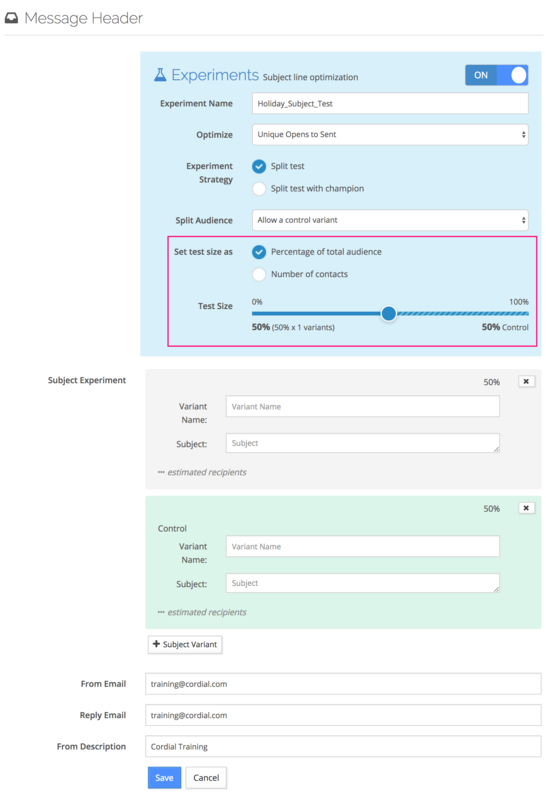 You are able to set the test size as a percentage or a specific number of contacts. When the strategy is set for split test with champion, you are able to have the remainder of the audience be sent to the best performing variant after a specified delay. 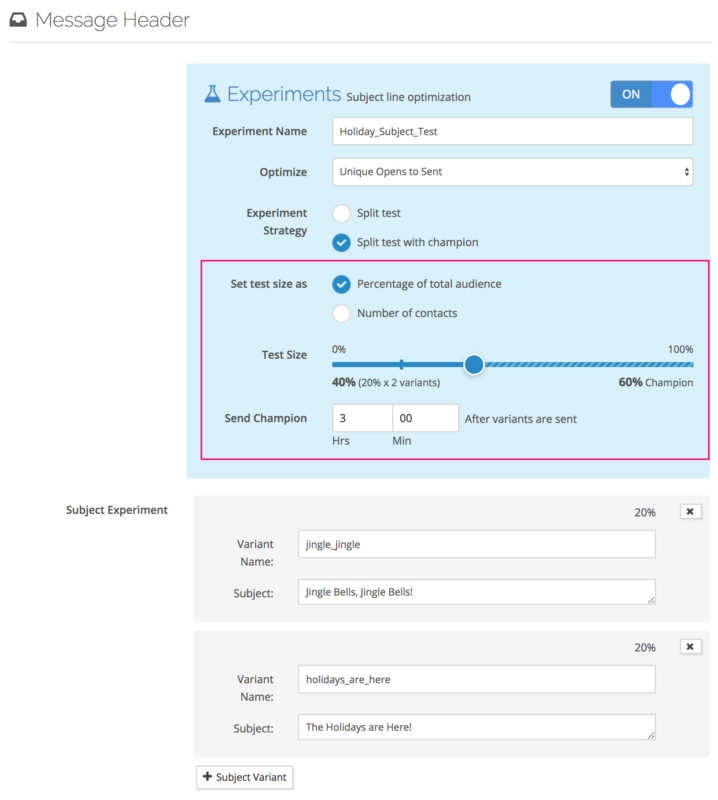 You may set the test size as a percentage or a specific number. You have now configured your experiment. Name both of your variants (note: only alphanumeric characters, dashes, underscores). 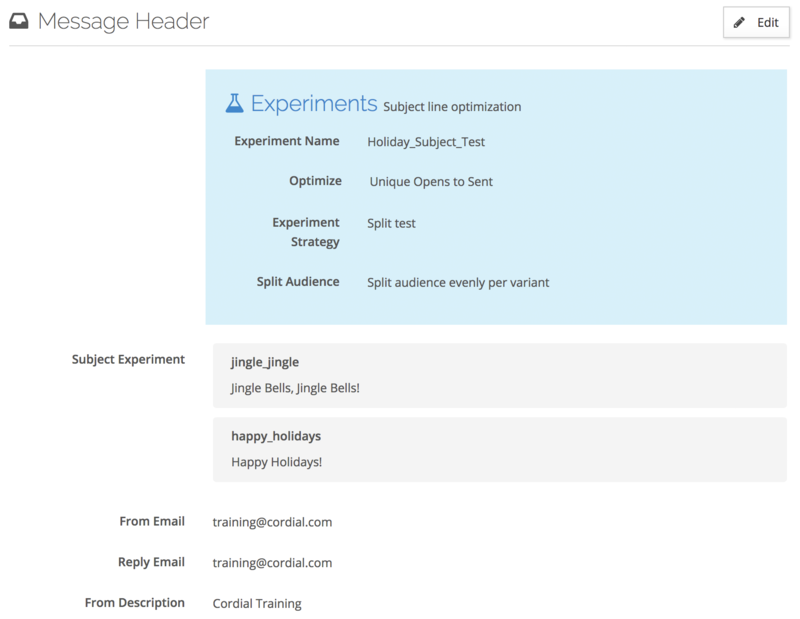 Enter the subject lines to test. 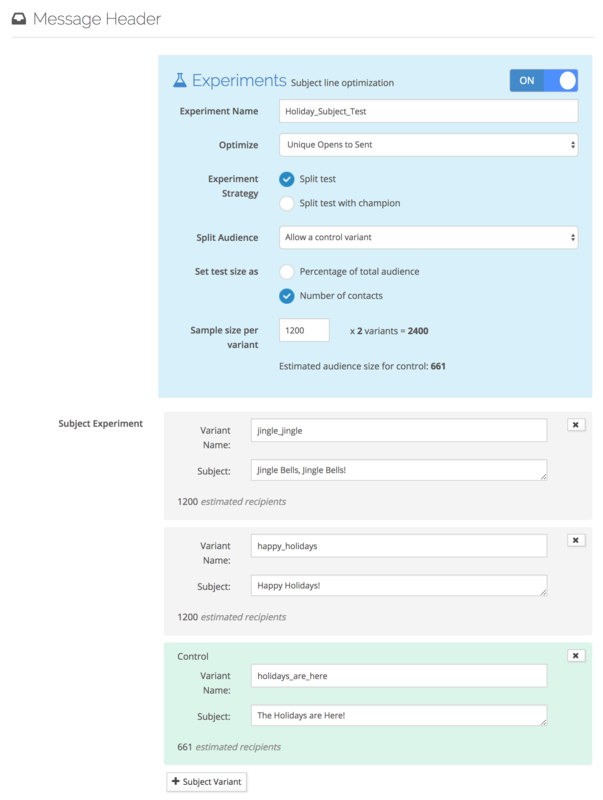 Click + Subject Variant to add more variants to test. You will see a preview of the details in the message header. Your subject line experiment has now been configured. Test n test variants (same size population) and 1 control as remainder. Test n test variants (as a percentage) and 1 control as remainder. Test 1 single variant and 1 control as remainder. Remainder sent to the champion after 3 hours. Remainder sent to the champion after 3 hours (60%). In the next article learn about body experiments.